DIE Sabbati, videlicet, 23 die Aprilis. Heads for the Conference about Lord Newnham's being discharged of his Embassy to Venice. Report of the Preface to the Attorney General's Judgement. Message to the H. C. that the Lords are ready to give Judgement against him. Attorney General at the Bar. Sir Edward Herbert, Attorney General's Sentence. A Witness in the Cause of Lady Hastings versus Poulton. Justice Mallet's Petition to be bailed. The Lord Chief Justice of the Common Pleas was appointed to be Speaker this Day. "That, upon Information of a Discharge sent from Sir Edward Nicholas, by His Majesty's Command, to the Lord Feilding, the Seventh of this Month, from his Employment as Ambassador at Venice, whither their Lordships had formerly recommended his speedy Return upon public Occasions, as also their Lordships Engagement to the Ambassador of that State residing with His Majesty here, have thought fit to impart the same to the House of Commons; not only as it is a Matter of public Concernment, and so expressed by the House of Commons in the First Article of the Remedies to cure the great and pressing Evils under which the Kingdom labours, which the Lords have assented to, but also in Relation to Persons of Honour and Worth, who ought not to receive public Discouragements, where they desire rather public Thanks. Amongst such Persons my Lords do esteem my Lord Feilding, upon whom this Discharge falleth more heavy, not only in Point of Honour, being discharged of his Employment before he had taken Leave of that State, but in his Fortune also, his Personal Estate at Venice lying in Pawn with his Family, which he left there by His Majesty's Order, and his Real Estate in this Kingdom being mortgaged for some Time, in respect that the Arrears due unto him upon that Entertainment have not been paid unto him. This Inconvenience is not bounded in the Person of my Lord Feildinge; for, when the Notice of his Discharge as Ambassador to that State shall be known, he will not be able to decline the public Sale of his Goods there, which my Lords conceive will reflect upon this whole Nation, being a Place so conspicuous to all Foreign Parts." Ordered, That this House approves of this to be the Substance of this Conference. To desire a Conference, by a Committee of both Houses, in the Painted Chamber, as soon as it may stand with their Conveniency, touching the First Article in the Declaration containing the Grievances and the Cures. That the House of Commons will give a present Conference, in the Painted Chamber, as is desired. The Lord Robartes was appointed to speak at this Conference with the House of Commons. Hodie 1a vice lecta est Billa, An Act for the enabling of Sir Robert Cooke, Knight, to pay his Debts, and make some further competent Provision for Dame Theophila his now Wife. The House of Commons being ready in the Painted Chamber for the Conference, the House was adjourned during Pleasure, and the Lords went to the Conference; which being ended, the House was resumed. Then the Lord Robartes reported from the Committee the Preface to be before the Judgement to be given against Mr. Attorney General; which being read, this House approved of it. To let them know, that their Lordships are ready to give Judgement against Mr. Attorney General, if they will come and demand (fn. 1) it, with their Speaker. The Peers, in the mean Time, did put on their Robes. That the House of Commons will come, with their Speaker, presently, and demand Judgement against Mr. Attorney General. The Peers being set in their Robes, the House of Commons, with their Speaker, came in; and then the Gentleman Usher of the Black Rod brought Mr. Attorney General to the Bar, who kneeled as a Delinquent, until the Speaker of this House, by Directions of the Peers, bid him to stand up. Then the Speaker of the House of Commons said, That the Knights, Citizens, and Burgesses of the House of Commons, having impeached before this House Sir Edward Herbert, Knight, His Majesty's Attorney General; the House of Commons have commanded him, in their Name, and in the Name of all the Commons of England, to demand Judgement of their Lordships against him." 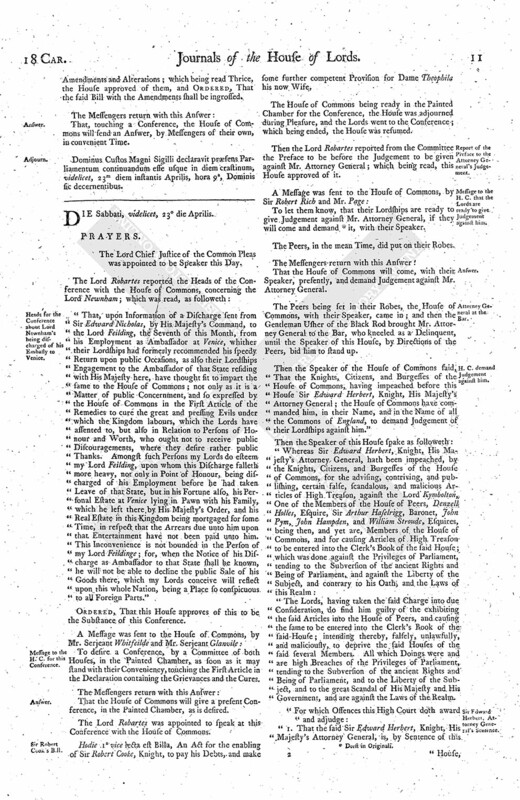 "The Lords, having taken the said Charge into due Consideration, do find him guilty of the exhibiting the said Articles into the House of Peers, and causing the same to be entered into the Clerk's Book of the said House; intending thereby, falsely, unlawfully, and maliciously, to deprive the said Houses of the said several Members. All which Doings were and are high Breaches of the Privileges of Parliament, tending to the Subversion of the ancient Rights and Being of Parliament, and to the Liberty of the Subject, and to the great Scandal of His Majesty and His Government, and are against the Laws of the Realm. "1. That the said Sir Edward Herbert, Knight, His Majesty's Attorney General, is, by Sentence of this House, disabled and made incapable of being a Member, Assistant, or Pleader, in either House of Parliament, and of all Offices, saving that of Attorney General, he now holds. "2. That he shall be, by Sentence of this House, committed to the Prison of The Fleet, during the Pleasure of this House." This being done; the House of Commons, with their Speaker, went to their own House. Ordered, That Mr. Attorney General shall forthwith stand committed to the Prison of The Fleet, until the Pleasure of this House be further known. Ordered, That the Lord Newburgh is discharged of his Recognizance, in which he stood bound for Mr. Attorney General. 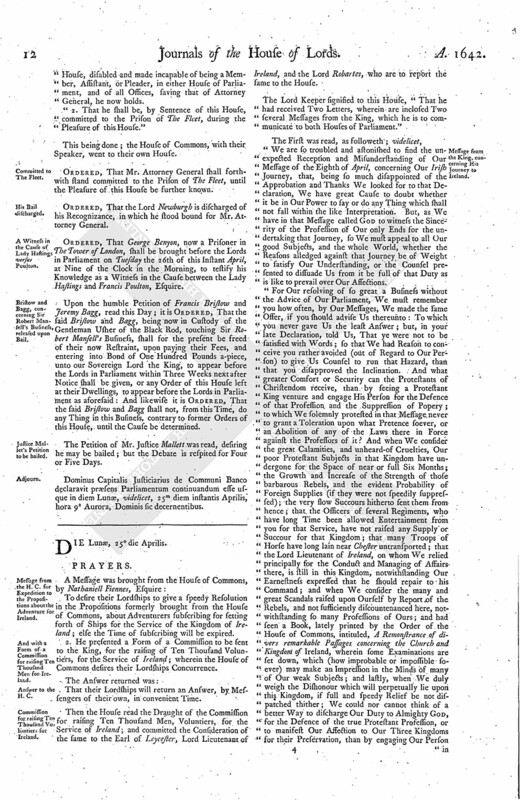 Ordered, That George Benyon, now a Prisoner in The Tower of London, shall be brought before the Lords in Parliament on Tuesday the 26th of this Instant April, at Nine of the Clock in the Morning, to testify his Knowledge as a Witness in the Cause between the Lady Hastings and Francis Poulton, Esquire. Upon the humble Petition of Francis Bristow and Jeremy Bagg, read this Day; it is Ordered, That the said Bristow and Bagg, being now in Custody of the Gentleman Usher of the Black Rod, touching Sir Robert Mansell's Business, shall for the present be freed of their now Restraint, upon paying their Fees, and entering into Bond of One Hundred Pounds a-piece, unto our Sovereign Lord the King, to appear before the Lords in Parliament within Three Weeks next after Notice shall be given, or any Order of this House left at their Dwellings, to appear before the Lords in Parliament as aforesaid: And likewise it is Ordered, That the said Bristow and Bagg shall not, from this Time, do any Thing in this Business, contrary to former Orders of this House, until the Cause be determined. The Petition of Mr. Justice Mallett was read, desiring he may be bailed; but the Debate is respited for Four or Five Days. Dominus Capitalis Justiciarius de Communi Banco declaravit præsens Parliamentum continuandum esse usque in diem Lunæ, videlicet, 25m diem instantis Aprilis, hora 9a Aurora, Dominis sic decernentibus.